Superhard Acrobatics is level 5-7 in Yoshi's Island DS. It takes place in the sky, and Yoshi has to jump over multiple moving platforms and spikes. 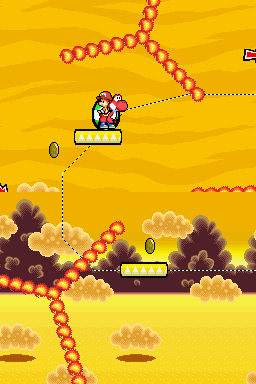 Yoshi starts the level on a cloud and eventually has to hop on a moving platform network filled with enemies which takes him to the Middle Ring. He has to repeat the same process until he gets to the next area which starts off with some enemies, number platforms, and balloons. He has to avoid some more obstacles until he reaches the next area, which starts off with a Middle Ring and a Stork Stop. Yoshi needs to grab a Super Star and let Baby Mario cross the spikes. The player soon finds the next area which starts off with a Middle Ring and continues with some enemies and moving platforms, and ends with some Fire Bars and the goal roulette. The Japanese for this stage is similar to that of KEEP MOVING!!!! from Super Mario World 2: Yoshi's Island. They are also the second final level in both games. This page was last edited on April 15, 2019, at 02:16.